If Oberon can swing at the big-bad, he will. Otherwise he'll attack one of the lesser fiends. Fenwick hurls a holy water flask at the lesser demon attacking Oberon, it hits him square in the chest, shatters in a spray of liquid, and the fiend collapses in a pile of smoking flesh! Bart stands next to Fenwick, short sword ready. Dolgrim tries to hit the ash demon with demon-bane, but is not able to do so. Guntram [autopilot] strikes out at a lesser demon with his mace, but misses. Oberon manages to advance and attack the ash demon, now that his lesser foe has been vanquished by Fenwick. He feels the power of his sword against the fiery demon, but it is not enough with the ash cloud swirling about him and choking his air - he misses! Finnr hurls his last holy water flask at the ash demon, but it flies wide and shatters against the rear wall next to the statue. The two lesser demons attack Guntram and Grimma. Guntram is hit, raked by a demon claw. The ash demon lashes out at Dolgrim, but his claws do not connect. 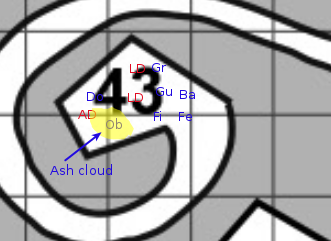 Here is a zoomed-in map to make things clear, AD is the ash-demon, LD are the two remaining lesser-demons. Oberon is choking on ash and is wounded. The big ash demon is wounded. Lesser demon #1 (was fighting Oberon) is dead. Finnr unsheathes his enchanted short sword and charges towards the Ash Demon! "Back to the pit with you!" Fenwick throws his second (and final) flask, this one at the ash demon! OoC: Can Oberon extricate himself from the ash cloud? If so, he'll do that, otherwise he'll make a blind swing at the Ash Demon hoping the sword will find its mark with not too much guidance from him. greyarea wrote: Fenwick throws his second (and final) flask, this one at the ash demon! Fenwick thinks that if he moves forward a rank, he could target the ash demon. But then he would open himself up to (possible) attack by the lesser demons. Mike wrote: OoC: Can Oberon extricate himself from the ash cloud? The ash cloud seems to stick with Oberon, no matter which way he moves. He can still attack, just with the -2 penalty. Dolgrim will keep hacking away at the ash demon! Oberon attacks the Ash Demon with vim and vigour, confident that his magic sword's +6 enchantment will cancel any penalties for ash in the eyes. 'Back from whence ye came o horrible smoking stack of filth!' Coughs Oberon. Well, in that case, he targets the LD in the middle of the room. Simultaneous attacks for round #3! The two lesser demons attack Guntram and Grimma. Guntram is wounded again by the demon's claws. The ash demon lashes out, piercing a weak spot in at Dolgrim's armor and wounding him with his fiery claws. Fenwick hurls a holy water flask at a lesser demon, it breaks on the creature's arm but he keeps fighting. With a cry and a swing of her sword, Grimma beheads her lesser foe! Dolgrim sinks demon-bane into the ash-demon's shoulder, but it keeps fighting! Finnr dives into the fray with Oberon and Dolgrim, leading with his sword, but cannot hit the ash fiend. Oberon is being choked nearly to death - but in a last effort he thrusts Vei-Eldur forward and the blade sinks deep into the Ash Demon's chest. Oberon feels a surge of power and has a vision of the Demon's true name and past - Vuod, who posessed a priest of the Elder Temple centuries ago, and in this form killed the temple's earthly inhabitants. The swirling, choking ash collapses inward and in a final, fiery ball disappears. Oberon can breathe again! The husk of what was once a priest of the Elder Temple falls to the floor, now a pile of dust. One lesser demon remains, Guntram evades his claws and then the beast is set upon by both Grimma and Guntram, who both strike decisive blows, killing it. It is suddenly quiet, and you all feel as if a darkness has lifted from the temple, a great evil vanquished. At the back of the room, you see the broken and toppled statue of a bearded man holding a sphere. Where the statue has broken open, you can see the glint of gold and jewels. The ash demon is banished! Lesser demon #2 (was fighting Grimma) is dead. Lesser demon #3 (was fighting Guntram) is dead.